One of the most visible prediction markets now calls the US presidential election for the incumbent. President Obama to win is now trading at 57.1, while Romney is valued at just about 40. That “he” is “Bill Brennan, a principal at the water hedge fund Summit Global Management.” How many water hedge funds are there? Note, too, the possible rise in old tensions: inter-regional, rural vs urban, environmentalists vs developers. A good example of using prediction markets for forecasting purposes comes today from the American political left. 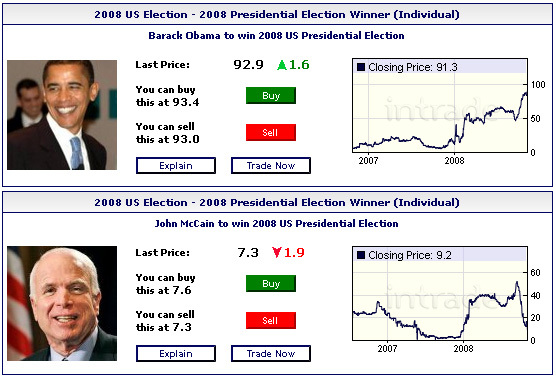 Talking Points Memo consults the Intrade futures site to suss out the US presidential election. Some good criticism of prediction markets there. Be sure to check the reader response email, included in the post’s second part.